Just to give you all some more information and in respect to a couple of requests I will put up two pictures of the signs by this new and huge dam. Then I will post another photograph which may help to see just how really big this dam is. This is the first sign, certainly the oldest of the two signs near to the dam. I just love the figure of five billion drachmaes. This is the second sign, it is a bit newer that the top sign but together I hope they give a better picture of what is happening here. I see here that the cost is just over six million euros. And this is a photo to try to illustrate the size of this dam. Behind the deserted house there is a huge wall of rock and stone that just goes straight up, as you can see. 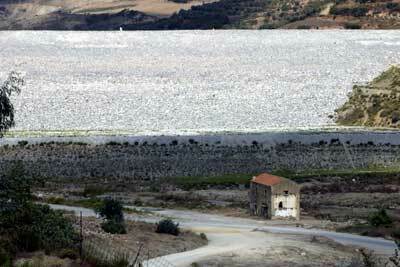 On the top of the dam are a couple of small white buildings. Crete, a Dam and Life. Ti na karnoume – what can we do? Life goes on. This week has been a quiet week in the village. Last Friday we had the quiz at a taverna interestingly called A Popsi. Then, the next day, I drove up to the Amari valley to see Lampros at the taverna Aravanes to give him the second copy of the Crete Courier newspaper which contained my article about the Amari and mentioned him. He was over the moon. We got a free double coffee and Ann, my wife, got several gifts of mountain tea and Laurel. (We call them Bay Leaves in English). Back down we came past the incredible dam. A huge construction around 30 Km south of Rethymnon that seems to have been built by both the Rethymnon Water company and the Agricultural water company with a lot of help from the European Commission. Interestingly it has no turbines to generate electricity, or so Lampros told me. Anyway, the dam will (hopefully) fill two valleys with water. The only village to be affected is the village with no name, at least no signs, that lies before the dam under the proposed water level. Empty houses and buildings and olive trees cut down to preserve their wood for future winter fires. It is like a desert in a sense, no people, sawn off trees and the expectation of water. I hope it fills. They close the dam in December as I am reliably informed in the hope that in time it will fill. But having seen the Amari and knowing that the island of Crete is largely limestone, I have my doubts. But who can deny the enterprise, the work that it has taken to build this largely unknown dam and the local quarries for the stone. The current road winds gently down under the future water levels then up and round the dam. When the dam fills the road will go a different way, a stunning way. You can see the formation of the new road as it climbs up towards the dam. Then it goes across the top of the dam. Straight across the top of the wall and onto the other side of the valley where it stays above water level and joins, eventually, the old road to the Amari. The road has still not yet been finished, but we shall see. Anyway, on we go towards Rethymno across the incredible Venetian bridge on this unknown road. Over the pass and onto the new road just built down the valley. As the new road ends we get into the winding roads of Rethymno and finally get back to the National Road and are only allowed to get onto it towards Iraklion. Who knows, what is a U-turn between friends?